Selçuk Tourist Information Office, see details below. In ancient times the area now occupied by the town was part of the city of Ephesus. During the Christian Byzantine era it was known as Agios Theologos (Greek, Άγιος Θεολόγος) after the Basilica of Saint John the Theologian. In the Seljuk and Ottoman periods Turks referred to it as Ayasoluk (Ayasluğ). In 1914 the town was renamed Selçuk after the Seljuk Turks who settled in the area in the 12th century. and 75 km south of the provincial capital Izmir. 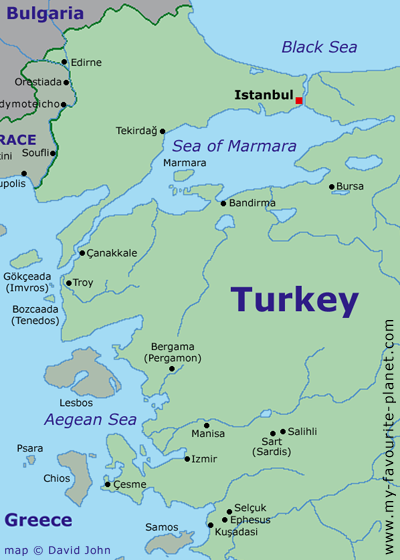 geography: Selçuk and Ephesus lie on the flood plain on the silted-up mouth of the Küçük Menderes river (Small Maeander; known in ancient times as the Cayster; Greek, Κάυστρος, Kaystros). The plain is interspersed with hills, and bounded by low wooded mountains. The mild climate and rich silt allow a variety of fruits and vegetables to be grown around the town. Horses and cattle are also bred here. can be found in our introduction to Turkey. Free maps of Selçuk and Ephesus available. 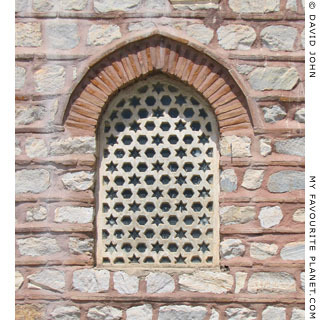 A window of the Saadet Hatun Bath Museum. 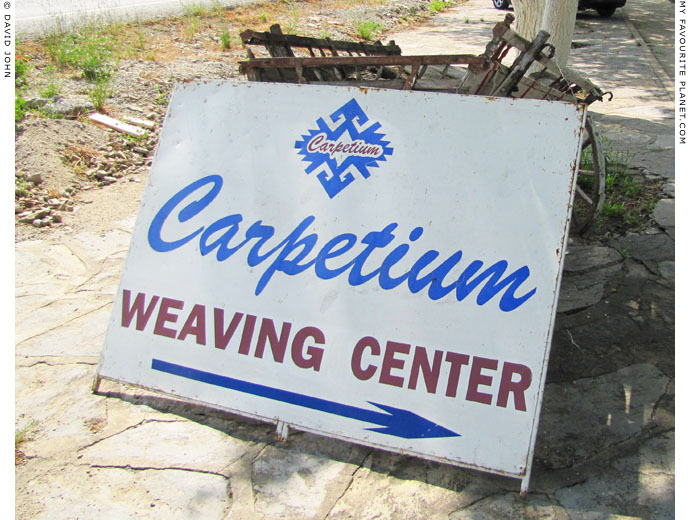 A large roadside sign advertising one of the carpet-weaving centres around Selçuk. Many guided tours include a visit to a carpet-weaving centre. Visitors are shown the various stages of traditional carpet production, from silk worm to finished product. It can be fascinating, but is not everybody's cup of tea, and some tourists complain that they feel obliged to buy, and that they would rather spend their time seeing more of Ephesus and Selçuk.